Need something different for the big game this weekend? 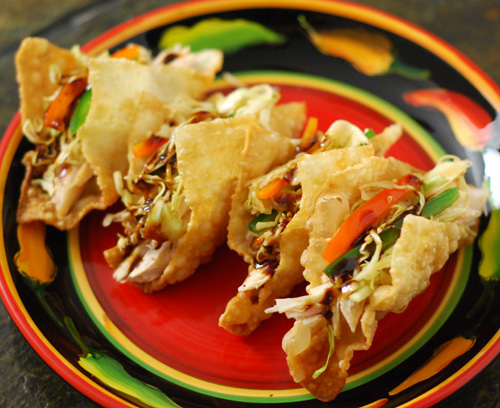 Try these little tacos with an Asian twist. McCormick recently released their annual Flavor Forecast. The focus is on global flavor, emerging food trends, and flavor pairings. I think the trend that caught my attention the most was "No Boundaries". No boundaries? There's anarchy in the kitchen, woo hoo! Here's what Chef Mark Garcia has to say about anarchy in the kitchen....errr, No Boundaries. The No Boundaries flavor profile that I chose to check out was tamarind, sweet soy sauce, and black pepper. And the boundaries that I chose to violate are Southern BBQ, Mexican cuisine, and Asian cuisine. 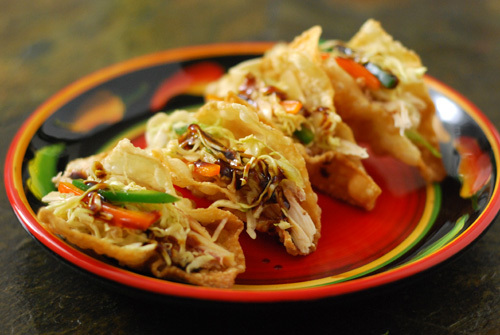 These mini tacos use leftover BBQ chicken and Asian influenced slaw. Mix the slaw ingredients together and toss. Refrigerate for 1-4 hours prior to serving, tossing occasionally. Whisk the sauce ingredients together thoroughly. Pour oil until it is 1/2" deep in a small sauce pan. Heat the oil to 350f. 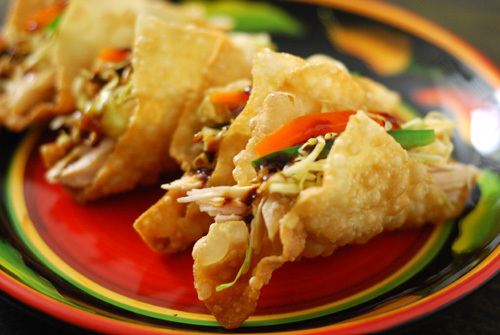 Fry the wonton skins until they are crispy and golden brown, about 20-30 seconds a side. My technique to do this is to hold one corner with tongs and lower half of the wonton into the oil, holding the bottom half in the oil using a slotted spoon. Then flip over and repeat. Place on a raised rack to drain. Warm the chicken and 1/4 cup of the sauce over low heat in a saute pan. Assemble each taco with some of the chicken, slaw, and then squirt just a bit more sauce on top*. I used some chicken that I had smoked, making sure to get a mix of white meat and dark meat. You could use leftover rotisserie chicken. Just tear it by hand or shred with two forks. The slaw recipe makes a little more than you will need. 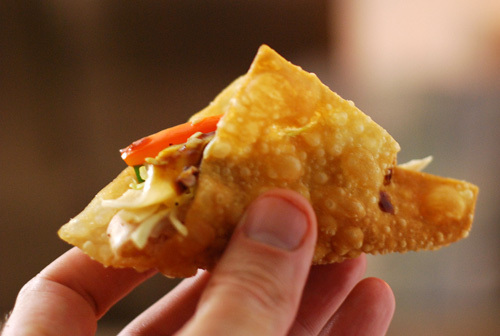 Fry another few wonton skins and have some veggie tacos. They rocked too. Sorry for the "precise" measurements here, but we're making tacos, not baking. This sauce would be phenomenal on grilled wings too. 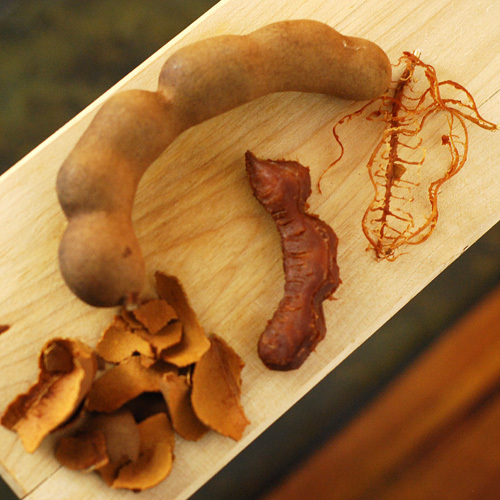 Learned how to make tamarind paste with this one but you can just buy the paste. I was a little intimidated by these odd looking pods, but it was very easy. The shell breaks by hand and then you just peel off the "strings". I made sure each one got a slice of each pepper, not just for taste but color too. Tiny tacos but big flavor! [Standard Disclaimer] I received compensation to help promote McCormick's 2012 Flavor Forecast but all opinions stated are my own.